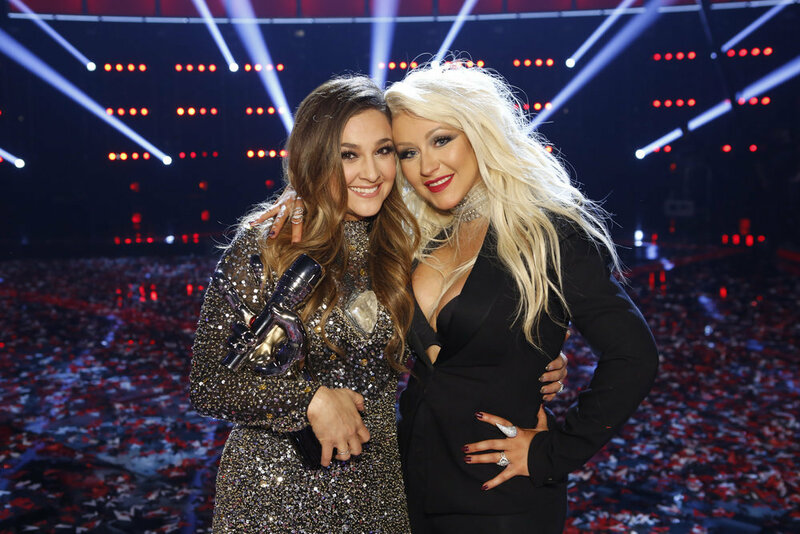 Alisan Porter's victory on "The Voice" on Tuesday night wasn't just a victory for the former "Curly Sue" star but also a huge win for her coach, Christina Aguilera. Aguilera became the first female "Voice" coach to have a champion on the show after 10 seasons. "Tonight is a true victory for women," she said backstage after the win. Porter faced off against Hannah Huston (Team Pharrell), Laith Al-Saadi (Team Adam) and Adam Wakefield (Team Blake). Al-Saadi placed fourth and Huston third, leaving Porter and Wakefield to go head to head. But Porter, who memorably brought Aguilera to tears during the blind audition early on in the season, was the last woman standing. The season finale also boasted a duet between Christina Aguilera and Ariana Grande (who replaced the planned Whitney Houston hologram), a performance by Little Big Town, Eagles guitarist Joe Walsh, Sia, Zayn, Alison Krauss, Cee Lo Green and Blake Shelton.